After dinner Randy helped Zoe mold her mouth guard so it fits her teeth. Last week I watched Zoe during her first sparring class and I was amazed. She was not shy or scared or holding back in any way. At first she was partnered with another girl who is about her age and size and who is the same belt rank. It was also her classmate’s first night in sparring class, although they’ve been together in martial arts class since kindergarten. So that didn’t seem so crazy. They were evenly matched and that particular girl is fierce but Zoe completely held her own. They even wrestled! I’ve never seen Zoe wrestle anyone except Zeke, who is not even two yet (although he can still tackle her and knock her over). But then as the class went on, there was an exercise where the students were divided into groups of five or six and each individual had to stand at the front with the instructor and spar every person in line, one at a time. Then there was the time the whole class was in two long lines and every few minutes they rotated, so Zoe started out against her original partner but eventually was sparring with much bigger, older, and more experienced students. 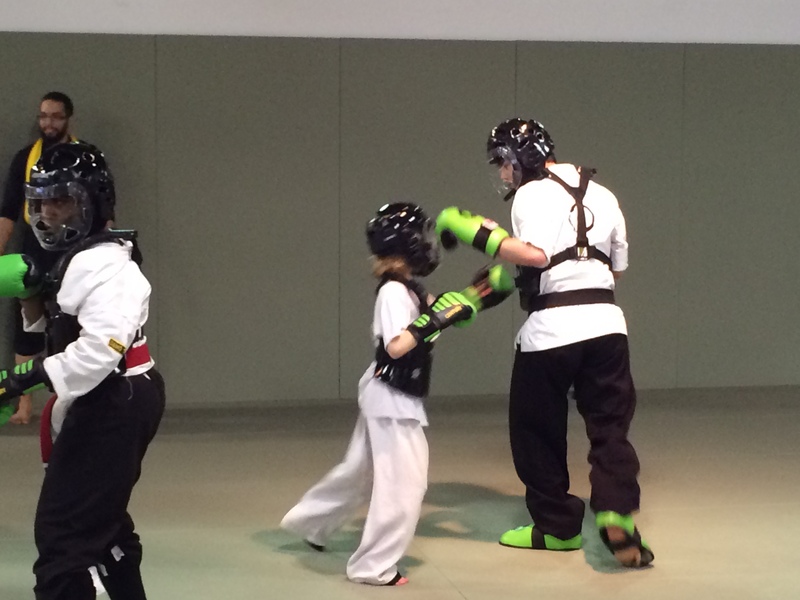 In the picture above, she is sparring with a black belt, one of the student instructors. I think he’s 14. He’s also exhibiting supreme control. Master Emerson instructed the big kids to be very controlled with the younger ones, and they were. But they weren’t standing back and letting the younger ones beat up on them either. I was really shocked at how exciting it was to see Zoe spar. While martial arts is, technically, the art of war, I have never felt like Zoe’s classes at Evolve All are about fighting. They are about discipline, respect, resilience, perseverance, teamwork, compassion, technique, and kokoro–Japanese for heart. They talk about the black belt attitude, which is about improving yourself and helping others, among other attributes. During the growth ceremonies, the candidates for black belt have to read essays, break many boards using a form they’ve created, and spar with their classmates and Master Emerson for several challenging minutes. The sparring has always been my least favorite part. This is not fighting–everyone is wearing protective gear but it is not the Karate Kid and no one is actually getting hurt. It’s all about technique and stamina. You can tell from watching it is very hard work for these kids. So I’ve always known Zoe would eventually need to start sparring, but I wasn’t in any rush. What I was eager for her to do was audition for the demo team–the group of kids who perform really impressive techniques and routines during the growth ceremonies and at community events. This was the first year she would be eligible. But then they changed the demo team meeting time to a day that didn’t work for our schedule. And Zoe’s instructor Mister Christian said that sparring was more relevant to what she was learning in class and that would be a better place to start in terms of augmenting her regular classes. And to my surprise, Zoe expressed enthusiasm about sparring. She asked for sparring gear (not cheap) for her birthday. Last week Zoe asked me if I thought she was a tomboy, because, she said, “I like things that boys usually like, like Star Wars and martial arts and soccer.” Not to mention the series of books about tribes of crazy fighting cats that she and all her friends of both genders are obsessed with. I told her that I thought tomboy was a silly and meaningless word, and that she’s a cool person with diverse interests who didn’t feel limited by stereotypes in her choice of things to do or enjoy. I probably used other words, but that was the idea. Later in the week she approached Randy with the same question and he gave her basically the same answer (yay united parenting front!). Clearly she is thinking about what, if anything, it all means, promoted probably by starting to spar. What I think it means is that she is a strong, independent individual. How great is it to start owning your strength and independence when you’re not even eight years old? I love the fact that when boys in her class write or read something about Star Wars they rush over to tell her about it, because apparently her Star Wars fandom is well known. Zeke wishes he could spar too. He’s always trying to put on Zoe’s gear. I wish Evolve All would bring back the young masters class for three- and four-year-olds. But Zeke will have his day on the mat. In the meantime, it’s Zoe’s turn and she is not holding back. « Haiku: telling me/Not to be scared anymore/I can teach a class!